The RV Gourmet: A Meal or a Snack? A Meal or a Snack? I was reminded of this recipe while reading the RV Centennial Cookbook. 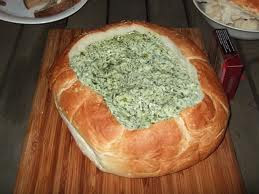 I've made spinach artichoke dip with the same recipe for years and always loved it, by using a 10 oz box of frozen spinach, defrosted and squeezed dry, instead of the crabmeat. My family loves an addition of red pepper flakes to the finished product to add some "heat." In the spinach artichoke version we also like bacon bits. 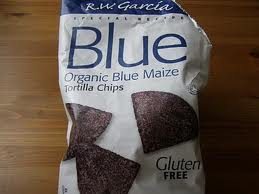 Our favorite dipper is a grainy, or blue corn chip. A novel way to serve a creamy dip is in a hollowed out rustic bread loaf . If you use this idea, cut the center section you hollow out, into small cubes and serve them with toothpicks on the side for dipping. Preheat oven to 350 degrees. Combine cream cheese and mayonnaise. Mix well. Press garlic into mixture. Drain artichokes; chop and mix with crabmeat. Combine Parmesan cheese, green onions, and lemon zest. Mix all ingredients together and add to cream cheese mixture. Spoon mixture into a 1½ qt. baking dish. Bake 25 to 30 minutes or until golden brown around the edges. Sprinkle with red bell pepper and additional green onions. 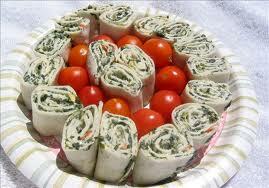 Another variation with creamy dips is to spread a small portion on a flour tortilla and roll up. They can either be served as pictured or cut into little round bite sized spirals. BTW, you'll be tempted to make this as a meal side dish or even a meal once you try it. ENJOY!